Expect a resolution very quickly. The football team starts practices in a few days, and when someone is placed on paid administrative leave, that is a pretty good sign that the parties involved are negotiating terms of separation. Here, it is uncertain at this time whether OSU interprets Meyer's possible behavior as violating the terms of his employment. Furthermore, that would absolutely influence how OSU goes about any separation discussions, but at the same time, it would be understandable that both parties want to handle this and move forward in a swift, adequate fashion. What does Meyer's Employment Contract Say? The Employment Contract ("Contract") between OSU and Meyer is pretty detailed and extensive, but that is expected when you are unarguably one of the best college football coaches in modern history... results-wise, anyway. For the most part, the addendums tweak language to change with the shift from the BCS to the College Football Playoff and to hike up the compensation he received for the incredible results on the field he has managed to produce, but the most recent one adds some relevant fun to the mix! Together, these documents make up the entire Contract. To keep this analysis as comprehensible and succinct as possible, let's state a few specific provisions regarding (1) his duties of employment, (2) breach of contract, and (3) termination and post-termination, and use them in the analysis. 1.3: "Coach recognizes and acknowledges the importance of the maintenance and observance of the principles of institutional control over every aspect of such program. Coach agrees to recognize and respect those relationships and the organizational structure of Ohio State." 1.5: "Coach agrees to represent Ohio State positively in public and private forums and shall not engage in conduct that reflects adversely on Ohio State or its athletic programs. Coach shall perform his duties and personally comport himself at all times in a manner consistent with good sportsmanship and with the high moral, ethical and academic standards of Ohio State and its Department of Athletics." 4.1(d): "Know, recognize and comply with all federal, state and local laws, as well as ail applicable University Rules and Governing Athletic Rules, in accordance with NCAA Bylaw 1 1 .1 .2.1 , promote an atmosphere for compliance within the football program supervised by Coach and monitor the activities regarding compliance of all assistant coaches and other administrators involved with the program who report directly or indirectly to Coach; supervise and take appropriate steps in an effort to ensure that Coach's assistant coaches, any other employees for whom Coach is administratively responsible and the members of the Team know, recognize and comply with all such laws, University Rules and Governing Athletic Rules; and immediately report to the Director and to the Department's Office of Compliance Services in writing if any person or entity, including without limitation, representatives of Ohio State's athletic interests, has violated or is likely to violate or may potentially have violated any such laws, University Rules and Governing Athletic Rules (unless Ohio State has informed Coach that certain minor transgressions do not require written reports to the Director and the Department's Office of Compliance Services)." 4.1(e): Coach shall promptly report to Ohio State's Deputy Title IX Coordinator for Athletics any known violations of Ohio State's Sexual Misconduct Policy (including, but not limited to, sexual harassment, sexual assault, sexual exploitation, intimate violence and stalking) that involve any student, faculty, or staff or that is in connection with a university sponsored activity or event. If Ohio State's Deputy Title IX Coordinator for Athletics is not available, then Coach shall make such report promptly to Ohio State's Title IX Coordinator. Any emergency situation should be immediately reported to 911 and/or law enforcement. For purposes of this Section 4.1(e), a "known violation" shall mean a violation or an allegation of a violation of Title IX that Coach is aware of or has reasonable cause to believe is taking place or may have taken place". 5.1: Termination by Ohio State for cause - "[I]n addition to any of its other normally understood meanings in employment contracts shall include, but not be limited to, the following: ... (e) Fraud or dishonesty of Coach in the performance of his duties or responsibilities under this agreement; ... (o) Commission of or participation in by Coach of any act, situation, or occurrence which, in Ohio State's judgment, brings Coach and/or Ohio State into public disrepute, embarrassment, contempt, scandal or ridicule or failure by Coach to conform Coach's personal conduct to conventional and contemporary standards of good citizenship, with such conduct offending prevailing social mores and values and/or reflecting unfavorably upon Ohio State's reputation and overall primary mission and objectives, including but not limited to, acts of dishonesty, misrepresentation, fraud or violence that may or may not warrant criminal prosecution by the relevant authorities." With respect to the termination and post-termination processes, Exhibit A of the Contract is the template of the agreement that he and OSU would enter into should OSU terminate his employment for any reason other than "for cause". Here, OSU is careful to clarify that it will pay Meyer a set amount (the "Buy Out Amount" as detailed in a chart in the Contract) as liquidated damages, not compensation. Parties use a liquidated damages clause where an injured party's actual damages would be very difficult to ascertain properly or near impossible to prove should a party breach. So, by calling out that this payment is classified as liquidated damages, OSU is trying to prevent a scenario where Meyer comes back claiming to be an injured party and trying to collect damages. What could OSU do with Urban Meyer? Well, it comes down to three primary moves: Fire for cause, fire without cause, or keep the dude. Arguably, OSU could fire Meyer for "cause" because he breached his duties of employment expressed or any defined for "cause" reason in the Contract. If the university is looking to avoid paying Meyer damages for firing him, it would be critical to zealously argue that he violated the Contract in a specific way. First, one could argue that Meyer failed to recognize and respect the importance of institutional control based on section 1.3. By failing to report an assistant coach's potential lawbreaking activity, Meyer disrespected the notion of trying to maintain institutional control across all levels of the athletic department & football program's employment chain. This is not a clause that a strong argument would likely focus on, but it is a nice umbrella clause that evidences how important it is to OSU to retain institutional control. Second, one could argue that Meyer violated the Contract because he "engage[d] in conduct that reflects adversely on Ohio State" and did not conduct himself with the high moral and ethical standards OSU expects from him because in addition to showing a brazen disregard for the university's policies and procedures, if it is true that he knew, he blatantly and publicly lied when he said he knew nothing about the domestic violence allegations at Big Ten Media Days. The text messages are a simple foundation for this argument, and the university's investigation could definitely bring to light more supporting evidence. That is steps further than poor judgment but, instead, poor character that I am sure OSU would not want to have leading its young, impressionable football players. Third, if the university finds sufficient evidence in its investigation, one could argue that Meyer violated section 4.1(d) because he did not "promote an atmosphere of compliance of all assistant coaches and other administrators involved with the program who report directly or indirectly to Coach; supervise and take appropriate steps in an effort to ensure that Coach's assistant coaches, any other employees for whom Coach is administratively responsible and the members of the Team know, recognize and comply" with all state and local laws. If Zach Smith did abuse his wife, we can all agree that such behavior breaks the law. If Meyer knew about that and did not make any reports to his superiors according to OSU's procedures - "immediately report to the Director and to the Department's Office of Compliance Services in writing if any person or entity, including without limitation, representatives of Ohio State's athletic interests, has violated or is likely to violate or may potentially have violated any such laws" - he breached the Contract. The standard for when Meyer is supposed to make a report is very low, for if he was aware of Smith maybe potentially violating the law, he should have told the Director and the Department. Finally, there has been talk about a Title IX argument in firing Meyer. One could argue that he failed to follow the reporting procedures in section 4.1(e), but that is a much harder case to win. If basing an argument on this clause, one would have to show that either an incident happened at an OSU-sponsored event or function or on its grounds (e.g., Penn State) or have one heck of an argument that Title IX is the proper framework despite the victim not being a student at the university. True, this does involve allegations against someone on OSU's staff, but whether that is enough of a connection to the intentions behind Title IX is up in the air. This argument could work, but it is quite a stretch. Y'all can think for yourselves, but I spy with my little, green eyes a pretty sound basis that he violated sections 1.5 and 4.1(d). Moreover, if he did violate those sections, his actions would easily be brought under section 5.1's reasons OSU could fire Meyer for "cause" because of the dishonesty displayed at Big Ten Media Days and participating in this scandal that places OSU in an unfavorable light (see the language above for the specific language). Moreover, OSU could fire Meyer without "cause" because OSU can break the Contract all the same for any reason. It would just have to pay him damages, and the university contemplated those processes. The parties agreed to the amount he would receive and how that money would be dished out, and that would be the end of that. I think it would be more costly to the university's reputation to keep him around than it would be to pay up here. Easy peasy. On the other hand, it is totally a reasonable argument that Meyer did not fail to perform his duties of employment and, therefore, did not breach the Contract. OSU is free to interpret the Contract in that way that it chooses to keep him around. What should OSU do with Urban Meyer? As a young woman who has a distaste for all things related to OSU ingrained into every ounce of her being, it is admittedly difficult, in a way, to put aside my knee-jerk reaction to say that OSU should fire Urban Meyer. There are completely valid arguments for both firing him and keeping him. The tricky part in many assault situations is determining the line where a person's employment duties end and a purely moral obligation to act in a particular way when the person knows of domestic violence or sexual assault allegations against someone under his watch at work. I believe that the line is not as fuzzy here as it has been in other high profile cases, though, because of the expressed contractual language Meyer agreed to in his employment contract with the university and his history of surrounding himself in his career with high profile, high risk people (e.g, the players he chose to recruit at the University of Florida). True, OSU can always fire him without cause and owe him much more as a short and sweet public relations mood to remain in touch with its own history of decision-making (e.g., firing Jim Tressel in the midst of controversy) and with a very passionate "#MeToo" public sentiment, but I do believe there is strong enough justification on paper that OSU can let Meyer go for breaching the Contract. Then again, if OSU wanted to interpret the Contract to let him remain its head football coach, it could rightly do so. In my opinion, Urban Meyer clearly has not learned from his past mistakes, and he has not evolved with society's increasing understanding of assault and basic human decency. Does OSU really want to be associated with this man when it could truly have almost any football coach that it wants? 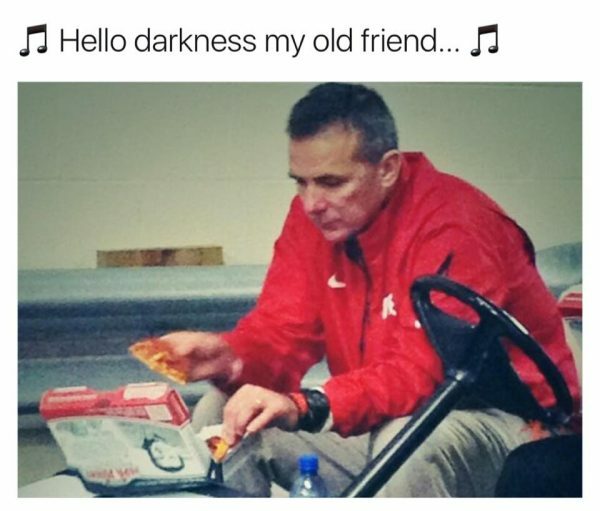 Whatever happens, I would not be opposed to seeing more "sad Urban Meyer eating pizza alone on a golf cart" images.